Nice quality...went together quicoand are a great addition to my kitchen. 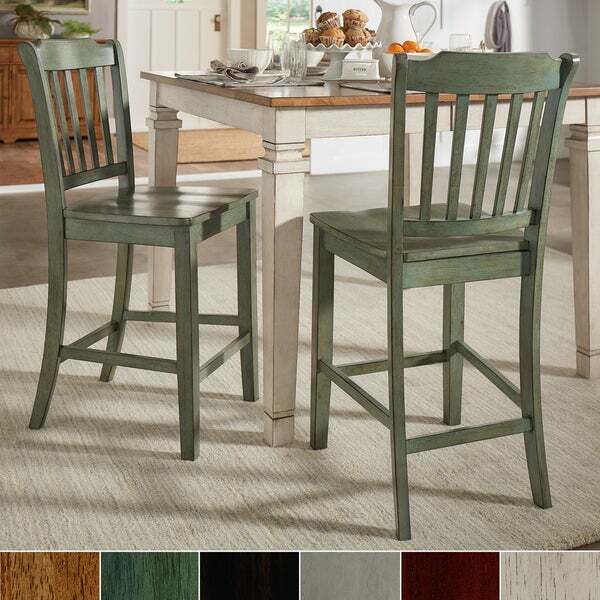 Add a beautiful, rustic look to your dining space with the Eleanor Slat Back Counter Chair from iNSPIRE Q® Classic. The chairs visible wood grain and graceful slat back adds a sense of antique charm to this design. This chair set is perfect for casual kitchen dining, or placed around a counter height table. The chairs are available in several distressed finishes, including neutrals and bright hues, so you can mix or match colors and express your unique design taste. At iNSPIRE Q®, our designer-curated lifestyles reflect current trends and timeless essentials, giving you the know-how to achieve your vision. With diverse style inspirations to choose from, youll be able to find the one that speaks to you - or mix and match across collections for a style thats all your own. The seat is nice, deep, and wide. Putting the chairs together was pretty easy. I was missing one or two screws... I forget, but I go to HD so much I just grabbed a few. Be advised that there are not 6 pilot holes in the seat for attaching that part to the bottom but the wood screws only take a tad of pressure to get them started. We bought these in several colors and heights to mix up our kitchen and dining. They are very sturdy and we are extremely happy with them. Chairs look nice, but are terrible to try and put together! The legs and the side rails do no line up, and you have to force everything together, which makes the inserts prone to breakage - as some reviewers have pointed out. This is even if you don't screw things in tightly, as per the instructions. (I barely screwed anything in to make sure that I had the give to "push" everything into place, and it still was a hassle.) I've put together a lot of furniture over the years for myself and family/friends, and I've rarely had something this prone to error. The first chair looks fine when put together. On the second chair, the side rails didn't go all the way in once I screwed everything together. Now, I have one chair that looks nice and the other I don't fully trust someone to sit in. All-in-all a waste of money, and too much of a hassle to return them. If the chairs cost this much - and are this hard to put together - it should include the "Handy" fee for someone to come and put it together for you. 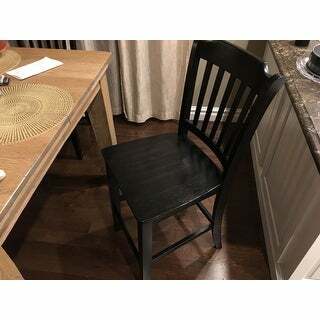 Again, the chairs do look nice - scratches and wear on them to look "rustic" I think - but not worth the money and hassle of trying to get them useable. This set of chairs are great! The color and quality are just what my kitchen counter needed. In love with our new counter height chairs! They work perfectly at our kitchen island and match our new Eleanor counter-height table! Very happy with this purchase! Very comfortable. Perfect height for our counter! These chairs look great and the distressing matches our farm style kitchen. They can be a little confusing to our together at first, but once you do one they’re easy. Our first set of two was missing a set of screws, but a quick trick to the hardware store and $4 solves that problem. One of the stools is a little wobbly no mater how much we tighten or loosen, so we put a furniture pad on one leg to even it out. We ordered five sets of these stools in antique white finish for our kitchen and so far they have exceeded our expectations! These chairs are solid, comfortable and very sturdy. These chairs are beautifully crafted with a wide seat for comfortable sitting and extremely sturdy. I am going to buy 2 more when they are back in stock. The chairs seem nicely constructed. The color is very nice and matches my other chairs very closely. The assembly was no very difficult at all. I am now able to keep these chairs at my bar without having to move my chairs from the table. Very happy with the quality and the ease of this purchase. Beautiful reddish stain, excellent solid construction, NOT AT ALL easy to put together - even for a cabinetmaker - and takes hours for a set of 4. Pieces fit well but not super well. You have to have a drill because the seats are not predrilled. THAT was very disappointing. You also need your own screw drivers & clamps to hold the joints when you glue them up. Recommend, but with strong caveats regarding difficult & slow assembly. Chairs arrived quickly and had the best packaging I've ever seen! They are very sturdy and somewhat heavy. Seem more professional quality than home use. The only mild criticism I have is the staining. Not done as evenly as I'd like. Overall, I really like them and they are perfect for our eating counter! Purchased these chairs to use with a hand made oak table love these chairs and the quality for price. Would recommend and purchase these chairs all over again. Chairs exceeds my expectations for quality. Very Sturdy with nice finish. However I ordered Light oak and received a pecan finish. decided to keep them because I looked for oak finish for 2 months. They do look good with my decor. I bought 2 sets of these chairs. They are comfortable, oversized & very sturdy. The first chair we assembled took 2 hours but we learned and were able to put the others together in 45 minutes each. A rubber mallet is useful to insure parts go together tightly. The finish is nice and the chairs are sturdy. Happy with this purchase. Love these but my husband was not happy with the amount of assembly required. We were anticipating needing to attach the legs or the back, but they arrived flat and in multiple pieces. "Is the antique white more of a creamy white or is it a brighter white just distressed?" Yes, the antique white is creamy and darker than a true white. "Will the gray be back in stock?" "I'm having trouble securing the seat with the chair using the small screws. Any suggestions?" "Any updates on the green style becoming available?" The sage green is expected to be back in stock in mid-March. "When will the green style be back in stock/available??" The green option is expected to be back in stock in late January 2018. Variety of colors & value.